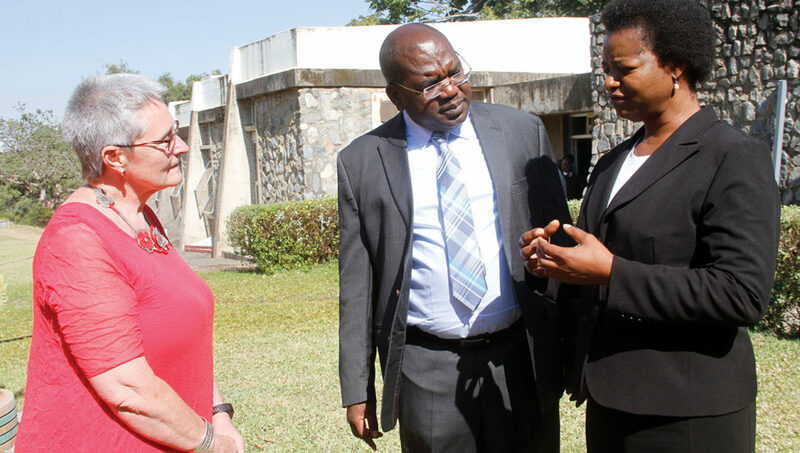 PATRICIA Lambert (left) with Minister of Health Chitalu Chilufya (centre) and Deputy Speaker Catherine Namugala at Parliament building after a meeting with parliamentarians on the draft Tobacco Products and Nicotine Inhalants Control Bill 2018. PATRICIA Lambert, a former South African anti-apartheid activist, says she felt privileged when the Zambian government invited her to help discuss the tobacco bill because of the role Zambia played in ending apartheid.Coming to Zambia for the first time in June, 2018 was a great opportunity for Ms Lambert to give back to the country which immensely contributed to South Africa’s liberation struggle by hosting the African National Congress (ANC) leaders who were in exile. Ms Lambert, a human rights and labor lawyer now working in the United States of America (USA) as director at the International Legal Consortium at the Campaign for Tobacco-Free Kids, served as legal advisor (1997 – 2007) to the South African government during the presidencies of Nelson Mandela and Thabo Mbeki. In that role, she worked on various aspects of post-apartheid law reform, including the implementation of South Africa’s strong domestic tobacco control laws. It was during her stint as legal advisor to the South African government that she came to know the role Zambia played in liberating that country. “I came to learn that the African National Congress (ANC) was hosted by the Zambian government when the ANC leadership was in exile, so it is an enormous privilege for me to be invited by the Zambian government to comment on tobacco bill,” she said in an interview. ANC leaders’ period in exile in Zambia is well documented in many pieces of writing. One of the books: (The Lusaka Years: The ANC in exile in Zambia, 1963 to 1994) authored by Hugh Macmillan, documents an extraordinary story of the ANC in exile in Zambia, where the organisation had its headquarters for most of the time after it was banned in South Africa. After the white minority apartheid regime unbanned the ANC in 1990, those in exile started returning back home after decades of being in exile, mainly in Lusaka. Zambia was possibly the most important host country to the ANC leadership over a period of more than 30 years, argues Macmillan in his book. It was in Lusaka that the headquarters of the external mission of the ANC was located for most of the exile years and where a succession of delegations from South Africa travelled to speak to the ANC in the second half of the 1980s, the book accounts. “At one O’ clock I was in Lusaka, and at three O’ clock I was in Cape Town,” Thabo Mbeki described his return, with other leaders of the ANC, from Zambia to South Africa on April 28, 1990 after 28 years in exile. ‘‘On the tarmac in Cape Town, he stood beside his father, Govan, who spent 23 years on Robben Island, and wept tears of sadness, not of triumph, for the lost opportunities, the lost years’’, Macmillan writes in his book. Other ANC leaders in exile in Lusaka included Oliva Reginald Tambo, whose house in Avondale area has been turned into an ANC national heritage house. Walter Sisulu was also among those released from exile from Lusaka in January 1990, almost the same period Nelson Mandela was released from prison after serving for 27 years. It is this role that Zambia played in the liberation of South Africa that Ms Lambert appreciates. “In a tiny way I feel as if I am putting back into Zambia for all that Zambia gave to the African National Congress when it was in exile. Zambia played a special role in hosting ANC leaders, and this holds special memories and appreciation in the hearts of many South Africans,” she said. Although she grew up in South Africa during the apartheid era enjoying a life typical of privileged white people, she felt it was wrong for other nationals to be mistreated. “When I matured, and I realised what was happening to me, I took a decision that I would like to work towards liberation of my country and that has been my passion for a number of years,” she said. Initially trained as a teacher, she had to sell her house to pursue a degree in law which she felt would help her to effectively make a contribution to the anti-apartheid movement. “I then combined public health with law and that brought me to the African National Congress policies on public health. One of the tremendous public health (rules) was that you need to protect people, you cannot just deal with health when people are ill and in studying those policies, I came to learn Zambia’s contribution to the ANC. Immense contribution,” she said. After leaving the South African government portfolio as a legal advisor, she moved to Washington DC, USA at the International Legal Consortium at the Campaign for Tobacco-Free Kids. Ms Lambert is an ardent advocate of tobacco control after losing her father to tobacco-smoking related ailments. She said smoking deprives families of basic needs as resources were channeled wrongly to buying of cigarettes. “My own father died when he was 51 years of age. It was an enormous blow to my family. He had been smoking since he was 11years old. He was a poor boy, he took to cigarettes because everybody said was fun, but now look at the price my family is paying?” she said. It was her advocacy role in tobacco control that earned her the Zambian Government’s invitation through the Ministry of Health to have an input in the draft of the Tobacco Products and Nicotine Inhalants Control Bill 2018. The Bill is in the process of being enacted into law to fulfill the World Health Organisation Framework Convention on Tobacco Control (WHO-FCTC) obligations to protect the public from the devastating health, social, economic and environmental consequences of tobacco consumption and exposure to tobacco smoke. Ms Lambert, who held high level discussions with the Ministry of Health and other ministries, parliamentarians and other stakeholders, observed that the bill contained all the measures that were in the FCTC which had scientific evidence-based measures to save people’s lives. Zambia became a party to the WHO-FCTC treaty in 2008 but has not yet enacted a tobacco control law. Ms Lambert said in the last 10 years that Zambia had not enacted a tobacco control law, the number of smoking people had kept on increasing from 10 to 25 percent in men and from seven to 17 percent in females. “What does that mean, from the time one starts smoking, to the time they get sick, its 10, 15 to 20 years. When that sickness strikes, the cost for health is big.This is a tsunami of disease and death waiting to take down people in Zambia who could be contributing to the economy. This Bill is important,” Ms Lambert said.